Coronary angioplasty – or PCI and PTCA – is a technique for treating coronary heart disease and angina. It helps improve your blood supply to the heart muscle and can help to relieve angina symptoms. You might also have angioplasty if you’ve already had a coronary bypass but your angina has returned. You’ll usually have an angiogram before your angioplasty, but sometimes this is carried out at the same time. Angioplasty is sometimes used as an emergency treatment for people that have had a heart attack or unstable angina (angina that comes on with less and less physical activity or even while you are resting). The start of the procedure is the same as an angiogram. A catheter – a fine, flexible, hollow tube – with a small inflatable balloon at its tip will be passed into an artery in either your groin or your arm. The operator then uses X-ray screening to direct the catheter into a coronary artery until its tip reaches a narrow or blocked section. The balloon will then be gently inflated so that it squashes the fatty tissue in the narrowed artery, allowing the blood to flow more easily. The catheter contains a stent - a small tube of stainless steel mesh. 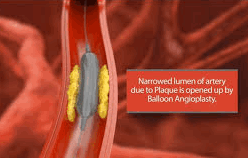 As the balloon is inflated, the stent expands so that it holds open the narrowed blood vessel. The balloon is let down and removed, leaving the stent in place. If you have a stent, you’ll need to take certain anti-platelet drugs to help reduce the risk of blood clots forming round the stent. When the test is over, the catheters are removed. Sometimes there might be a small amount of bleeding when they are taken out. A nurse or doctor will press on the area for a short while or they may put in a plug called an angioseal to stop any bleeding. After the procedure, you’ll need to stay in bed for a while. When you get home, check your groin area. Expect to have some bruising, but if you get any redness, swelling or if the bruising worsens, contact your doctor. Before you leave hospital, you will be told what you can and can’t do when you get home. It’s best to avoid doing any demanding activities, such as heavy lifting for a week or so. Most people find that they’re back to normal after a few days. However if you’ve also had a heart attack, it will take longer to recover. You might be invited to go on a cardiac rehabilitation programme. What should I do if I get chest pain after I go home? If you have not been diagnosed with heart disease and you get chest pain, you should call 999 immediately for an ambulance. The information below is for people who already have coronary heart disease and are being treated for it with GTN (glyceryl trinitrate) spray or tablets. You may also sweat, feel light-headed, sick or short of breath. Step one: Stop what you are doing. Step two: Sit down and rest. Step three: Take your GTN spray or tablets. Take the GTN as your doctor or nurse has instructed you. The pain should ease within a few minutes. If it doesn't, take your GTN again. Step four: If the pain does not ease within a few minutes of taking the GTN the second time, call 999 immediately. Step five: If you're not allergic to aspirin, chew an adult aspirin tablet (300mg) if there is one easily available. If you don't have an aspirin next to you, or if you don't know if you are allergic to aspirin, just stay resting until the ambulance arrives. If you have symptoms that do not match the ones we have described above but you think you are having a heart attack, call 999 immediately. In the majority of cases, the blood flow through the artery is improved, and many people will find that their symptoms have improved. Sometimes the stent which has been inserted into the artery can become narrowed later on (restenosis). The blood flow through the artery can become limited which can cause angina. A small number of people have complications. Very occasionally, the treatment completely blocks the coronary artery and if the doctor thinks that this will do serious damage to the heart, a bypass operation might need to be done. Urgent surgery is needed in around one in every 1,000 cases. There is a small risk of having a heart attack or stroke. If you are in a stable condition when you have the angioplasty, the risk of this happening is less than one in 100. The risk varies depending on your overall health and your individual heart condition.